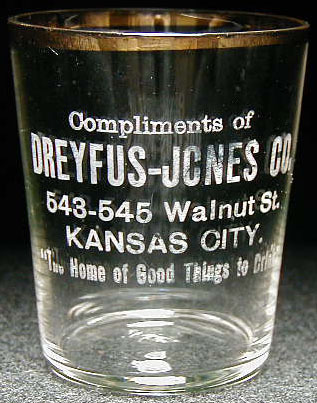 Inscription: Compliments of / DREYFUS-JONES CO. / 543-545 Walnut St. / KANSAS CITY. / "The House of Good Things to Drink"
Dimensions: 2-1/4" x 1-7/8" x 1-1/2"
Condition: The label is a little patchy in lower regions, but there is no damage to the glass. The rim is 85% or better!